The sycamore often gets a hard time – considered to be non-native having appeared even more recently than beech trees, and somehow an intruder, somehow ugly. But sycamores have been around in these islands for centuries, and are valued givers of shade on hot summer days, particularly for sheep and cows, and, sometimes, for farming tasks such as clipping. The wood is also prized among carvers, so don’t dismiss it too soon. It stands well in the British landscape, and has its own beauty. Get close and look at the bark – shades of grey and brown reflecting the shades of the landscape. 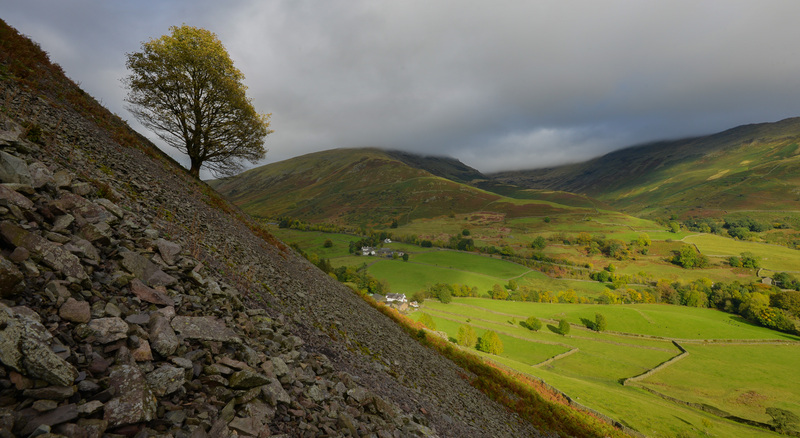 This sycamore has a view over land and literature, within sight of Dove Cottage, famously the first of Wordsworth’s houses in the Lake District, and of his two other houses Allen Bank and Rydal Mount. 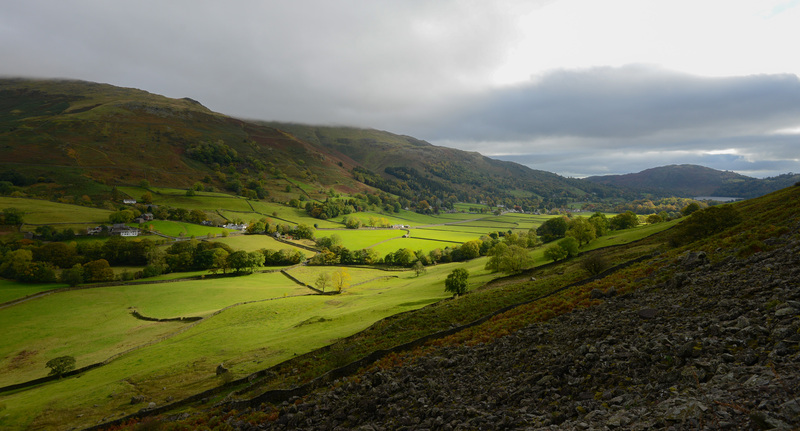 To the east, the fells rise to Helvellyn, the second highest peak in England, and to the south, the waters of Grasmere change to reflect the weather and the sky. Up the slope from this sycamore sits The Lion and the Lamb, a rock formation on the top of Helm Crag that has been represented in countless paintings. And there is a history of legendary fighting, with Lord Dunmail reputedly buried at Dunmail Raise (where the A591 climbs up and over towards Thirlmere) and his sword, perhaps, held deep within the cold waters of Grizedale Tarn. witness the flourishing of its progeny. We will list blogs here that talk about the sycamore – our walks, and what we learn about it. Keep checking back through the year.